Almaden RV, 5th Wheel, Coach & Trailer Service & Repairs. Since 1989 the Caprino Family has been dedicated to down-to-earth customer service. They run one of the few RV Service and Repair shops in San Jose with expert technicians that are truly factory trained and certified. Their longtime alliance with manufacturers gives them fast access to unique hard to get solutions. Today Almaden RV Repair in San Jose is one of the largest, trusted and busiest RV Service Centers in the western states. 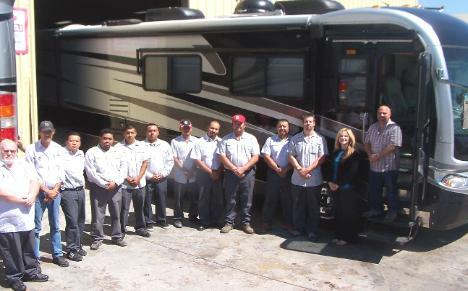 Almaden RV's friendly staff are veterans of the RV repair industry and many are factory trained. They know how to efficiently identify the needs of your RV, create an RV service and RV repair strategy for safety and reliability that fits your budget, manage every task to completion per factory specifications and get you back on the road in time for your next trip. Almaden RV Service and Repair Shop in San Jose has a fast growing referral base thanks to thoughtful and ongoing communication with their extended RV families. "For a fair price they did the job right the first time and along the way they helped me clearly understand everything I needed to know." This why we love our work and what makes us feel like were the best. Our Customer's Happiness is Our Happiness! RV Auto Body Repair and Paint Estimates Are At Not Cost. Almaden RV Auto Body Repair Shop in San Jose has an outstanding reputation with major insurance companies for excellent customer service with certified technicians that get the job done right the first time, on time and at a fair price. The complicated collision restoration of a Motor Home, 5th Wheel or Trailer can be an overwhelming experience for most. You can trust that the staff at Almaden RV are proven experts at managing your claim and all conversations with your insurance company from the very beginning all the way to completing your RV Repairs to your fullest satisfaction. Almaden RV Repair is an authorized Service center for all major appliances, generators, awnings and every within the coach. 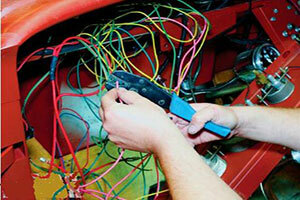 Since 1985 Almaden RV Repair has been achieving excellence with RV service and repair in San Jose. They have factory training, unique knowledge and experience and the wisdom to work on all makes and models of recreational vehicles. Free Motor Home Estimates and Upgrade Consultations for all types of RVs, 5th Wheels, Campers, Toy Haulers and Trailers. Quickly learn what your home-on-wheels may need now and in the near future for reliability, performance, comfort and a big fun-factor. Collect information about the possibility of significant enhancements for safety, steering, handling and stability upgrades that may provide greater comfort for all passengers. Collision restoration of an RV, 5th Wheel or Trailer can be an overwhelming experience. Put your mind at ease as Almaden RV are proven experts at managing your claim and all communications with your insurance company from start to finish. "I have been a thoroughly satisfied customer of Almaden RV for a number of years now, with 2 different 34' class a motorhomes. All repairs have been done to the highest standards. I have always been treated with the utmost courtesy and professionalism. i have nothing negative to say about any of the experiences I have had with Almaden RV. They have always performed their work flawlessly, on time and never have I been hit with any surprises in price or quality. I cannot recommend Almaden RV highly enough based on my personal interactions. My biggest concern is that if i were to need repairs on my coach and not be near Almaden RV to have the work done. They have my complete faith and trust, nothing more need be said." - Bob M.
"I just went in to get a couple little parts for my RV. I was greeted as soon as I walked in, was asked what I was looking for, and was directed to the appropriate section. The parts were, by and large, well laid out and easy to see. I found one part I was looking for, but couldn't find the other. Tanya said they could order it for me and probably have it in the next day. However, she wanted to check with Chris first to make sure we were ordering the right part and it turned out they had one in stock. I was in and out in no time flat, with everything I came to get, all at a fairly reasonable price." - William B. "I found Almaden RV through the Roadtrek authorized service search. I just wish I had found them sooner. Rod was my service tech and was extremely knowledgeable and helpful. I had a few larger fixes and a lot of small stuff and they fixed it all. They also serviced my refridge and hot water system. It was well worth the cost to have everything on my Roadtrek work correctly." - Scuba D.
"Great people. Once you get to know them, they will treat you like a family. When my mother goes here they treat her with all respect. Kathy and Chris are so wonderful. They are down to earth and treat everyone with respect." - Sam S.
"These guys are awesome. They helped us two days getting us fixed up and back on the road. They could not have been more helpful or professional. And they knew what they where doing. Their shop rate is $120 an hour but that is how they keep the doors open. We were just thankful they where there and helped us right away." - Mary, R.